I’ve found these tools to offer the maximum amount of flexibility for any engagement. Together, they can handle just about any process workflow. Coverage reporting from the CI server is probably the most important metric a development team can track. It’s the proof (or lack of!) that the code is working as expected. For new project I demand 90% “branch” coverage or greater. For legacy code, 70% is good. Branch coverage is conditional logic in your code. These are the business rules and where most defects are logged. I find that a 90% covered project will have 4x more unit test code than production code. This is great! It’s nearly impossible to introduce regressions into systems that are so well tested. Finding these regressions early reduces the Dev->QA cycle time. Once a developer checks code in, Jenkins runs the build and publishes metrics. It’s also great for public shaming. Everyone is emailed if the build breaks. 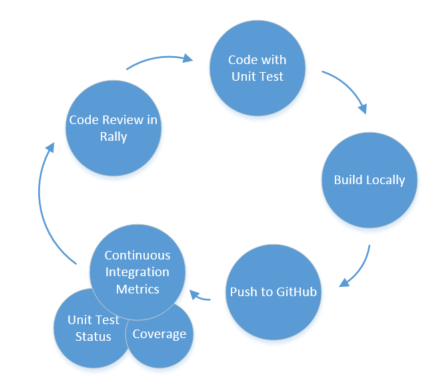 Jenkins then logs the commit and build result into Rally. From there, I can see all the commits associated with a story. Once a developer marks a story complete, it’s easy to code review right into GitHub. Building a good CI system isn’t trivial for the inexperienced. It now takes me about 2 days to build a system if I’m dealing with a decent codebase.